it has become definably colder and wetter over the past few days, and as i write from my idyllic hidey-hole on the edge of the atlantic (artistic licence; the atlantic is at least 14 miles away), i can hear the wind wrapping itself round most of the bushes outside, and having a darned good shot at making its way in through the open window. i believe that one of the weathermen on tv the other day defined the incoming as autumnal, though as a relative term, this obviously exists in varying degrees according to one's personal insulation. as a small agricultural nation, there has also been a noted upsurge in the amount of (i'm being polite here) agricultural effluent decorating the almost road surfaces, due to the accepted notion that islay cattle are free to roam wherever they deem suitable. 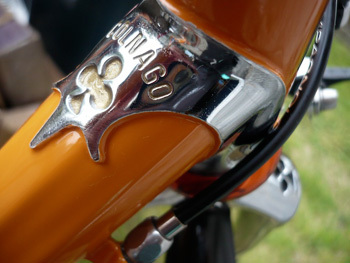 i have become inured to the wearing of mudguards on both the colnago and the cielo, for while it may present a serious dent to one's street credibility, it has the happy consequence of keeping the aforementioned effluent away from a pair of bright yellow mavic shoes. and, likely of more note, away from the inner an outer reaches of either frame. such freedom from concern can be yours too, if you'd care to place some roadracers on that team sky replica dogma. however, even a decent set of fenders cannot exclude all the gunk that accumulates on anyone's road surfaces, let alone the ones on islay, and it's a sad but true fact that it's all too easy to simply pop the still wet and dirty bicycle into the bike shed on arrival at basecamp. it would do the heart and soul great favour if we were to take a few moments to wipe down frame, components and wheels prior to stowage, but since we are likely in a similar state of disrepair ourselves, it's a task that is either forgotten, ignored or both. those few moments, accumulated over time, will come back to haunt you, as they have often do so to me. while it is possible to purchase bicycle chains in black, silver, gold and, in extreme cases of spending, titanium, i have seen none on general offer that are either orange or a dark reddish brown. yet that's often the sight that meets the less than fastidious cyclist, resplendent in sparkly sportwool as the shed door is opened. it's a situation that can occur at anytime of the year, quite frankly, but has a greater chance of being the case as autumn and winter approaches, and it therefore behoves the conscientious amongst us to practice a smidgeon of preventative care. there are as many oils and lubricants on the market as there are different carbon frames, and short of various biological and mechanical tests carried out with infinite precision, it is an onerous task to separate the men from the boys. and really, what is the difference between a dry-lube and a wet one, given that they're both wet at the point of application? motorex of switzerland, perhaps better known for applications within the motorbike world, provide a veritable slew of products pertaining to two wheels and a pair of pedals. i have had the opportunity to experience a number of these, some of which are very pragmatically contained within a handled, plastic tub; a small bottle of dry-lube, a can of chain degreaser, spray-on bicycle cleaner, a sponge and a drying cloth. additionally, i have a can of bike shine and a bottle of wet lube. i would be happy, at this point, to inform you as to which of the lubes is the better option, having applied the dry lube to the colnago, and the wet lube to the sram chain on the cielo. however, neither have experienced enough of the wet stuff to provide the definitive answer, so at some point in the future i'll feature a head to head. meantime, the only visual difference is the whiteness of the dry, and the oily clarity of the wet. both can be applied with ease to one link at a time by means of the application nozzle incorporated in each lid, and are of a viscosity that almost encourages a substantial number of drips on the ground. do not carry this out on the sitting room floor. 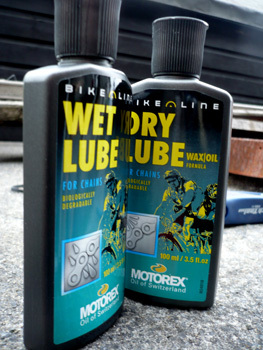 even on new, straight-out-of-the-packet chains, there are vestiges of grease; in order to test these motorex synthetic lubricants that can of degreaser came in very handy, cleaning both chains within an inch of their lives before applying the respective lubricants. this was my attempt to be squeaky clean (did you see what i did there?) and ensure any effect on the chains was via the motorex and not remnants of whatever i had on before. i have great preference for the economy of these small applicators as opposed to the spray cans which seem to lubricate every stationary object within a 15 mile radius. meantime, of more pressing need/desire, is the necessity to have that paintwork shiny and standing to attention, which is where the cleaning kit comes into its own. 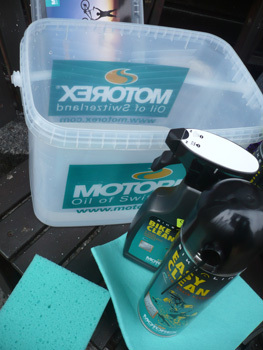 the motorex bike clean does what it says in the canister, aiming a fine spray all over every nook and cranny prior to the grunt work. leaving the spray in place for around five minutes loosens pretty much every dirt particle and allows it to be effortlessly wiped away with the supplied sponge and the bucket filled with warm water. and i really mean effortlessly. 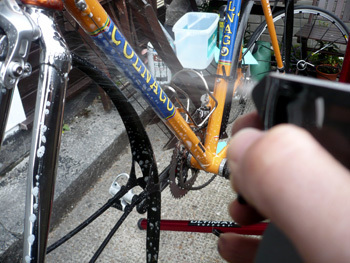 the cloth provides the wherewithal to effect a semblance of drying, prior to scooting the whole bicycle with delicate sprays of bike shine, leaving to dry(ish) before a modicum of elbow grease polishes all to a distractingly shiny finish. the worst part about all this is the fact that it really takes so little time, that it renders all excuses for not doing it completely redundant. all that remained was to empty the bucket of the now dirty water, plop the constituent parts back inside, snap on the lid, and all is ready for next time. and that won't be long in coming.